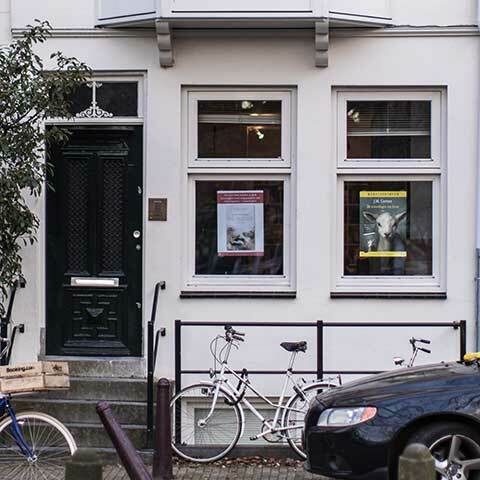 Cossee is an independent publishing house located at the Amstelveld, the most beautiful square in Amsterdam. The publishing house was founded in autumn 2001 and the first books were published in the spring of 2002. Cossee publishes Dutch and translated fiction and non-fiction. With their selected list, the carefully edited and beautifully designed editions Cossee wants to give their authors the best possible platform and a growing readership. We are on our way to London, and happy to bring a varied and exciting selection of books in our suitcases: amongst which the new novel by Eva Meijer, Forwards, Saskia de Coster’s Nightparents, a new Van Oord and Van Mersbergen, and a great selection of non-fiction, including 1942 by Herman van Goethem. 2019 has only just begun, but our reading list is already growing. Here’s a peak at Cossee’s spring catalogue with new titles by acclaimed authors Jan van Mersbergen and Eva Meijer, two fantastic classics by Marianne Philips, and the monumental 1942 by Herman van Goethem. In translation we are thrilled to be publishing amongst others works by Kristine Bilkau, Barbara Zoeke and Pia Pera. Cossee is ready for the Frankfurt Book Fair and more than happy to share this year’s selection with you: included are new novels by Saskia Goldschmidt and Bregje Hofstede, a debut by Dorothée Albers, a philosophical essay on depression by Eva Meijer, and the Climate Paradox by Peter van Druenen. Also included is a fantastic addition to the classics list, A.H. Nijhoff’s Two Girls and I. Despite the abundance of sunny days, we are already excited about the upcoming fall, which will see the publication of the new novel by Lodewijk van Oord No one is from here, and a brilliant new essay on depression by Eva Meijer. There will also be a photo-book on J.M Coetzee! In translation Cossee will be publishing András Forgách’s No live files remain, another David Garnett as well as Crusoe’s Daughter by Jane Gardam. With summer in full swing, we have a number of titles not to be missed on the reading list: the highly anticipated new novel by Saskia Goldschmidt, Dorothée Albers' debut A mariner's grave for a short story and Peter van Druenen's essay The climate paradox. Not to forget Bernhard Schlink's Olga, Milena Michiko Flašar's new novel on Mr. Kato, as well as a short story collection by Hans Fallada, which we will publish in translation. With the London Book Fair around the corner, we are excited to share our "Rediscovered Classics" list. Including successful authors such as Dola de Jong and Ida Simons as well as two new rediscoveries: Loekie Zvonik's Who was the hatter? and A.H. Nijhoff's Two Girls and I. Our fabulous fiction and non-fiction list for this year's spring fairs includes amongst others: Jonathan Robijn's intriguing Congo Blues, a Belgian debut by Astrid Panis, Peter Zantingh's new novel After Mattias, the fascinating Allah in Europe by Jan Leyers and the latest Gerbrand Bakker! Spring is around the corner and here at Cossee we are already looking forward to the upcoming publications: the new Gerbrand Bakker What About Nature?, a Belgian debut by Astrid Panis, a rediscovered classic by A.H. Nijhoff, Two Girls and I, the latest Mark Boog, an autobiography by Jacques Wallage and the astonishing tale of Herr Rabenstein. Furthermore, we are happy to be publishing amongst others David Garnett, Francesca Melandri and Husch Josten in translation. In 2017, a number of thought-provoking non-fiction titles saw the light at Cossee Publishers. We are thus happy to share the highlights of the past year with you, including the international rights success Animal Languages by Eva Meijer, the newest writing by Marjolijn van Heemstra and an essay collection by the eminent China correspondent Eefje Rammeloo. The Frankfurt Bookfair is coming up and we cannot wait to share our amazing Frankfurt titles of 2017 with you! We are especially excited about Jonathan Robijn’s Congo Blues, Marjolijn van Heemstra’s And his name is, and Eva Meijer’s fiction and non-fiction titles on animal rights! Also new this year the latest Rinus Spruit as well as the new Charlotte Mutsaers' Harness of Hansaplast. To support Dutch literature beyond our borders, translation grants can be obtained through the Dutch Foundation for Literature. For more information visit: https://www.letterenfonds.nl. Want to receive the latest Cossee foreign rights news?